The Tu B'Shvat celebration begins tonight, Tuesday 3 February. Tu B'Shvat is the New Year for trees. 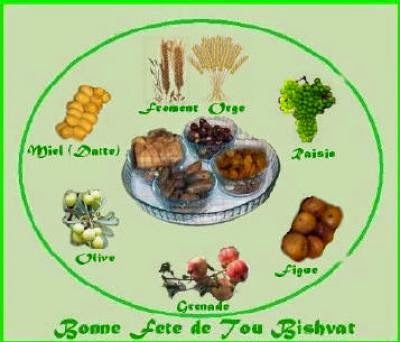 In the Moroccan tradition Jews celebrate a seder composed of wheat-based biscuits or barley, fruit from the tree (olives) and ground (date honey), white wine and red wine (grapes). Although the tree is rooted in the ground, the blessing of fruit from the tree (ha'etz) differs from fruit of the ground (ha'adama). It is the custom to eat fruits of all kinds preceded by a single blessing. "Baruch ata Adonai Elokeinu melekh aolam boreh mineh mezonot"
"Baruch ata Adonai Elokeinu melekh haolam boreh peri ha'etz"
"Baruch ata Adonai Elokeinu melekh aolam shéhékhiyanu ve kiyemanu vee higuiyanu lazeman hazeh"
4) Grapes: A prayer is said over four cups of wine. "Baruch ata Adonai Elokeinu melekh haolam boreh peri ha Gefen"
Citron: "The fruit of the citron tree"
Apple: "Among the trees of the forest, like an apple tree .."
(Song of Songs I, 3). Pear: "The fruit of renewal of Eretz Israel"
4th cup: Red wine only. We used to get little packets handed out each year at Hebrew school with a few of those items in it -- dates, figs, carob, raisins. It was wonderful.